Shift resources towards the important module universal robotic manipulator which replaces several custom machine designs with one standard construction whose functionality changes depending on the program. Tribute to Jef Murray, a skilled artist that has left our case too early. Open source projects are like milk readily available at a low price compared to drinking water and closed source products. Farms and ecological projects alike require an increase in efficiency to become independent from subsidies and donations respectively to the benefit of the entire community. 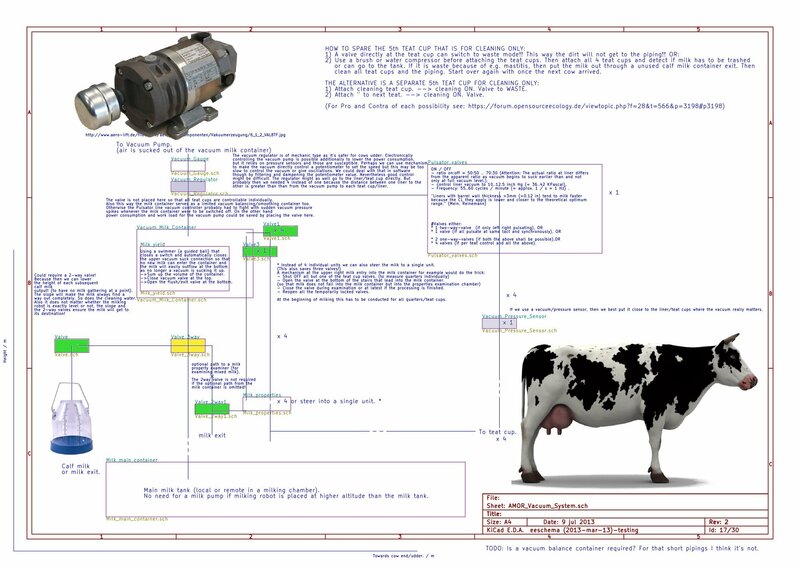 The previous milking robotic manipulator design is not certain to work with a real animal due to the limited workspace and the difficult base construction which requires reattachment (thus remachining) if there are more sizes or kinds of animals to be milked, e.g. goat or sheep teats pointing sidewards previously were hard to dock to. - Electricity and likely water bill increases. + Technical knowledge increases, hence perhaps some other good robot ideas may evolve. + Animals can decide themselves when to get milked. + Free decision of how often a day they are milked. (falsely labelled "interval" in DeLaval commercial milking system, milking frequency per day is the correct term though, because an interval is a time span). + Concentrated feed can be delivered automatically and according to milk delivered (in realtime). + => Easier and more adapted feeding ... a cow that produces more milk, requires more food if the rest state (e.g. influenced by activity) is equal. - Animals' possible illness not realized early enough. => Action taken too late. => Animal could die. - Gathering at Milking robot leaves behind a lot of unusable muddy terrain at entrance (doors, feeding, water pits in general). - Higher complexity in separation of milk for calves, though of course possible if valves and cleaning system are integrated. + Driving out and in of cattle no longer necessary as animals can get milked outside. + Tough animals can be tied to the robot frame automatically (and freed just in time). - Higher complexity (more modules and systems that interact). - Software more complicated because of the difficult interaction and the many modules that depend on each other and have to be monitored (e.g. if new food arrives, then the robot must realize it to open the gates (because the container needs weather protection) or be notified by the harvest robot). + Independence of any external supplies. ** Food (requires the worlddevelopment eco harvest robot, high level inter-machine communication). - Redundancy of susceptible subsystems (Electronics, in general: The more complex the system the higher the vulnerability). + Less cabling (length), water pipe laying. + Less maintenance (if redundant and watchdog or error correction exists, one can wait for enough minor errors to accumulate before taking the system apart). - Difficult to achieve a robust, lightweight (for truck to lift) & cheap system at the same time. + Rain serves as a water supply and natural (ecologic) and self-sustained washing. -> So AMOR must be waterproof! - Difficult to be flexible in frequency (provide user settings) and keep it simple at the same time. 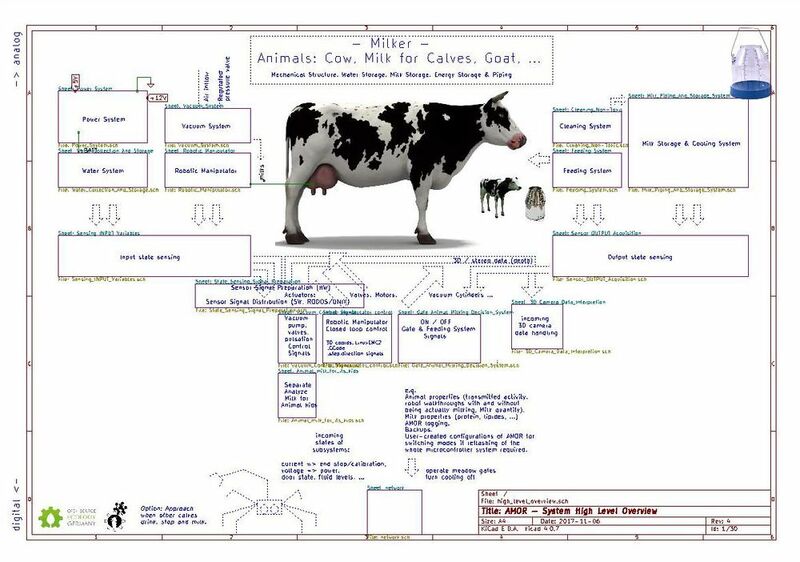 + Could be used for several other functionality than milking (doors, ...). => No hydraulics needed. Update: We have settled on keeping it all electric as it's much cheaper and we need electricity anyway. Note: As the robotic manipulator should be flexible anyway as it could be hit by the cow, compressible air/vacuum could serve this purpose, too - but price of vacuum cylinders and the vulnerability to leakage remains a problem. Vacuum pump: Any pump should do, as the required vacuum levels are low and we don't have a lot of volume to keep free of gases in a mobile system because there is not much piping. Animal within milking construction => Door states. Control of Feeding (derived from amount of milk), but also accept some user constraints (lower / upper bounds for each type of food respectively). Control of Robotic manipulator (joints, gripper). Collection & storage of the stored animal & product data. Microcontroller programs capable of controlling at least two AMOR system blocks (stacked next to each other). The mechanic structure is free to choose. Builders might have their own preference of how to assemble a milking robot structure. Some may choose to bolt sqaure beams together, the others might prefer welding (Schweissen) steel or if they have a TIG (Tungsten) welder even aluminium. Several ideas for autonomous power can be found in the forum. The easiest solution for now will be to attach a truck or emergency generator (UPS) or simply an extension cord. So we need a possibility to plug it into the grid (1-phase might be too low, but let's go for that first as the vacuum system needs by far less energy in a mobile robot than in a conventional one). This page was last edited on 31 May 2018, at 17:29.